Recently cooked up for our recent Banksia Bunch end of year get together was this scrumptious Nut Bar which disappeared in a flash. 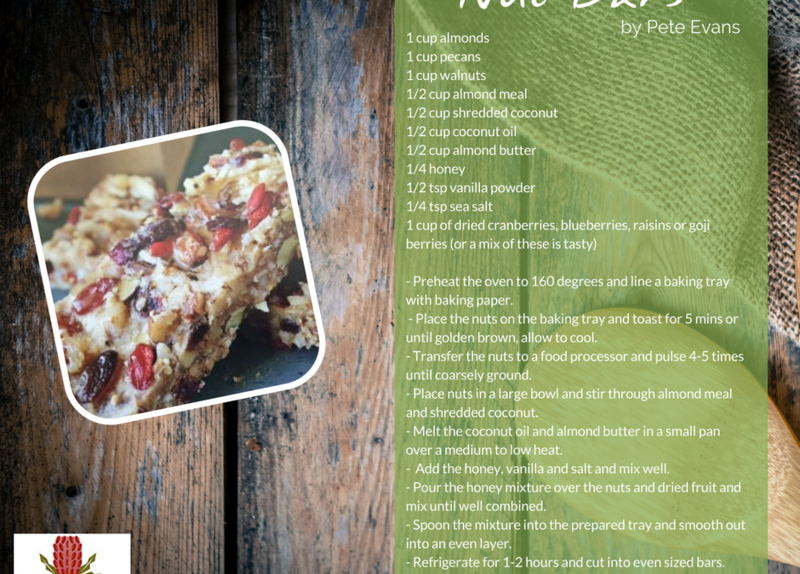 This is a very simple, healthy and super tasty treat from Pete Evans. Preheat the oven to 160 degrees and line a baking tray with baking paper. Place the nuts on the baking tray and toast for 5 mins or until golden brown, allow to cool. Transfer the nuts to a food processor and pulse 4-5 times until coarsely ground. Place nuts in a large bowl and stir through almond meal and shredded coconut. Melt the coconut oil and almond butter in a small pan over a medium to low heat. Add the honey, vanilla and salt and mix well. Pour the honey mixture over the nuts and dried fruit and mix until well combined. Spoon the mixture into the prepared tray and smooth out into an even layer. Refrigerate for 1-2 hours and cut into even sized bars. Store in an airtight container in the fridge for up to 1 week.